Open House 2015 is something you should read. 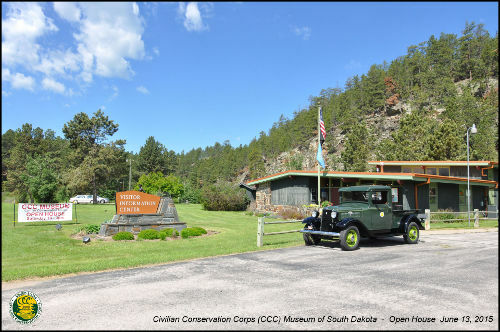 On June 13, 2015 the Civilian Conservation Corps (CCC) Museum of South Dakota held it annual open house. Kerry Conner drove over in his vintage CCC truck to attend the event. Special guests were CCC workers: Jay Hendricksen, Hill City; Pat Ryan, Custer; Elmore Omdahl, Rapid City and Melvin Fernau (age 99), New Underwood. About 70 guests enjoyed touring the museum and visiting with the men. Visitors often bring photos of the "CCC days" to share or even donate to the museum. Howard B. Jones' daughter brought her fathers photo album from his days in the CCCs. 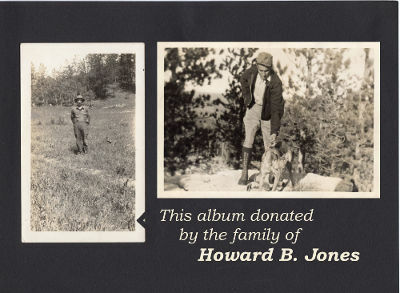 Howard B. Jones was at Camp Rochford. We truly enjoy these memories. Sharing them with the public helps tell the important story of the contribution to South Dakota and the nation made by these men. You can view a PDF of the scapbook here and a few more photos below. Be sure to stop at the museum when in the area and if you have anything "CCC" we'd love to see and hear about it!. Thank You everyone for another successful open house. Special guests were CCC workers: Jay Hendricksen, Hill City; Pat Ryan, Custer; Elmore Omdahl, Rapid City and Melvin Fernau, New Underwood.